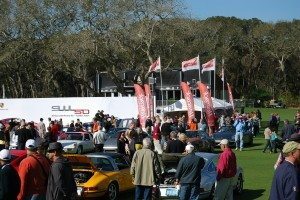 “When someone pointed out that the Amelia Island Concours d’Elegance was entering its third decade last March time seemed to slow for a moment. We usually don’t have time to think about things like that. From here it all seems to have happened very quickly. I suppose time does fly when you’re having fun. And we are. We have never forgotten that Concours Sunday at The Amelia is supposed to be fun. Someone actually called The Amelia “The Fun Concours” and we keep that in mind as we compose the classes, plan the schedule and lay out the filed. The whole thing begins to gather momentum when we name an honoree. That gives The Amelia a face. Then comes the creation of the poster and sourcing the cars of the honoree. Join us this year for Amelia Island Concourse d’Elegance.